Having inadequate or insufficient eyelashes (hypotrichosis) is a very common condition that affects millions across the globe, and can cause individuals to be self-conscious about their appearance. Fortunately, this condition is now correctable with the help of LATISSE® eyelash enhancer. As the first and only FDA-approved treatment for hypotrichosis, LATISSE® is a topical at-home treatment that can actually stimulate the growth of longer, fuller, and darker eyelashes. LATISSE® can produce visible results in as soon as four weeks. To learn more about how you can benefit from LATISSE® Eyelash Enhancer, contact Richmond Aesthetic Surgery to schedule your consultation. As long as patients maintain realistic expectations for results and are in general good health, any man or woman who has insufficient thickness of eyelashes may be a candidate for LATISSE® treatment. Your doctor will meet with you for an initial skin care consultation to discuss your needs and determine if this treatment is the best option for your goals. Due to the fact that eyelash growth is not possible overnight, our doctors encourage patients who use LATISSE® to remember that the treatment is designed to work gradually, and the results should become more prevalent over time. LATISSE® is comprised of a 0.03% bimatoprost ophthalmic solution, and while most patients will notice visible results within four weeks, it often takes 16 weeks for the eyelashes to grow to their final state. The LATISSE® solution is applied daily for the first several weeks; once significant results are achieved, the solution can typically be applied less frequently. In clinical studies 78% of LATISSE® users saw a significant increase in eyelash length, fullness, and darkness at 16 weeks. Mascara can still be used on eyelashes treated with LATISSE® to intensify the enhancement. 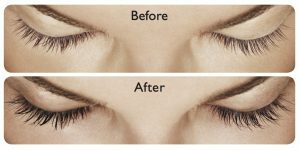 To learn more about how LATISSE® Eyelash Enhancer can help you generate fuller, thicker, darker eyelashes, please contact us today to schedule a consultation with our practice.